Clean and steam cauliflower until tender (about 6-10 minutes). Strain and add milk and butter into mixing bowl. Mix like mashed potatoes. Stir in beaten egg and parmesan cheese. Put into loaf pan and bake on 350° F (180° C) for about 20 minutes or until golden and bubbly. 324 members have added this recipe to their cookbook. I agree about adding the cheese to increase the flavor. It will, obviously increase the calories, but not the net carbs too much; maybe a couple. I'm cool with that. I really loved this recipe! Hubby and I would eat it cold when we had cravings for something healthy. I will make this even when off the diet. Thanks kcoppola! Increase the parmasan cheese to a cup or about a 1/2 a can of the grated... then add a cup of shredded sharp chedar cheese. then bake in muffin pans until lightly browned. You have yummy cheddar cheese califlour that even your kids will eat! this didn't taste very good. 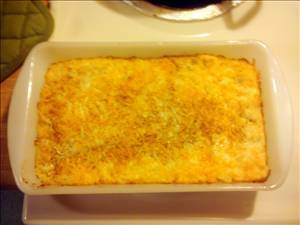 There are 211 calories in 1 serving of Cauliflower Au Gratin. Calorie break-down: 76% fat, 11% carbs, 13% protein.